Reflexology is a natural complementary therapy that uses a unique form of pressure point massage to stimulate "reflexes" on your feet or hands that reflect the body. 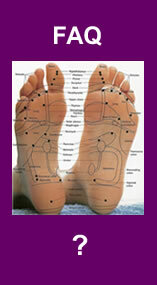 Reflexology is used to help relieve stress and improve well-being. A form of pressure therapy was used to benefit health and well-being by ancient cultures such as the Egyptians, Chinese and Japanese. In the West, modern Reflexology is based on the work of Dr William Fitzgerald (Zone Therapy) and Eunice Ingham. Current Reflexology training and practise derives from Eunice's pressure technique and Reflexology charts. Reflexology is a safe, non-invasive method of stress-relief and is suitable for all ages. Reflexologists are trained to work on reflex/pressure points to help stimulate your body's own healing systems and improve your well-being. Your treatment programme will be tailored to suit your individual needs. No, Reflexologists are not medically trained. If you are seeking diagnosis of a health condition it is advisable to see your Doctor. This will depend on the reason you are having Reflexology. As a general guide allow 1-4 weeks between treatments. Can I talk during my treatment? Yes you can talk but you may find that during your treatment you feel sleepy and want to close your eyes and take the opportunity to rest and recuperate. No. Reflexologists use a more precise, detailed technique to work on reflex points on the feet that reflect parts of the body. Your treatment will mainly feel soothing and calming. You will experience different sensations as your feet are worked on and some areas may be more sensitive than others. The pressure used on your feet can be changed to suit your needs. Clients' say that their feet feel very light after a treatment - "like walking on air". No, clients are often surprised that having their feet worked on does not feel tickly. Can I have Reflexology during my Pregnancy? Pregnancy Reflexology is a safe, natural and gentle way of relieving stress and anxiety throughout your pregnancy.